The disease known as Wart Disease (Syncny-trium endobioticum Percival), formerly known as Chrysophlyctis endobiotica, Cauliflower Disease, Canker, 'Fungus' or Black Scab, attacks the tubers and haulms of potatoes, giving rise to large and irregular outgrowths which suggest a resemblance to pieces of cauliflower. In bad cases these ' warts' may appear at the surface of the soil and can be detected at the base of the haulm as yellowish green masses. 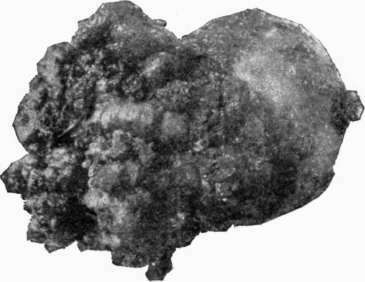 Warts or wrinkles appear at first in the eyes of the young tuber, and later several warts by growing together form a brown spongy scab, which finally rots and becomes black. This scab has no connection with ordinary potato scab and does not resemble it in appearance, but as both are frequently found on the same plant they are sometimes confused. The disease has caused most damage in gardens or allotments where potatoes are grown every year, but in a few cases there has also been serious loss in potatoes grown on farms worked on a four-course rotation. The occurrence of the wart disease in the affected districts is similar to that of the Finger-and-toe disease which, on certain soils and in some seasons, causes serious damage to turnips. Although in the first instance only a few plants may show the wart disease, it is almost sure to spread, and the disease must be treated as a dangerous enemy, which, if neglected, may entirely prevent the profitable culture of potatoes where it occurs. Land may be unfit for potato growing for as long as six years after infection, and possibly for a much longer period. The diseased tubers or haulms contain numberless 'spores' (the 'seeds' of the disease), which are not only capable of infecting healthy potatoes the following season, but appear to be able to he dormant in the soil for several years. The diseased tuber is the usual source of infection and the spread of the disease from one holding to another is mainly to be attributed to the planting of infected sets. When disease appears it may, if neglected, spread over a farm and render the soil useless for potato growing in the course of a few years. It is spread by manure, by the decay of affected haulms, tubers and runners in the soil, and it may even be carried from one field to another on implements and boots. Diseased potatoes must always be well boiled before being given to cattle or pigs, for infection is very readily spread by manure if raw diseased tubers are fed to stock. For the same reason diseased haulms must be burned and never be thrown on the manure heap; this should be done as soon as possible after the crop is lifted, as the 'warts' rot very quickly and further contaminate the soil. Dung which has been contaminated in any way should not be used for potato growing. If practicable, it should be applied to land under permanent grass. Seed' potatoes from a diseased crop or from a field in which disease is known to have occurred within six years should be avoided. If 'seed' potatoes are purchased in a district in which the disease is common, they should be bought as soon after harvest as possible, so that they may be kept under observation; the sets should be freely sprinkled with sulphur (four to five pounds will dress a ton) and should then be stored in boxes or pits until required. Tubers only slightly diseased may be easily overlooked, and may cause widespread infection when planted. Potatoes from an infected crop may appear to be perfectly sound when lifted, but after storing they may develop warts. It is important, therefore, that seed should be carefully examined before planting. As minute warts are difficult to see, a grower would be well advised to reject any seed potatoes among which diseased tubers have been found. In the case of a disease, like wart disease, which infects the land gradually, it is necessary to detect and stamp out the fungus as soon after infection as possible. 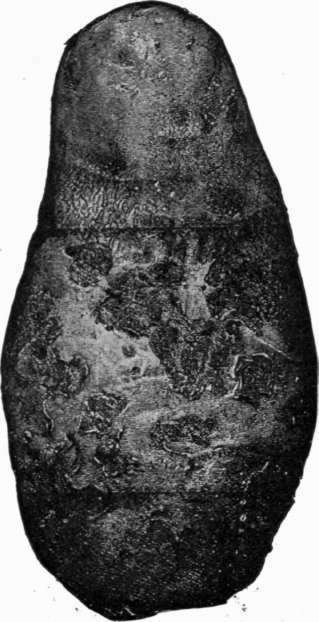 When discovered the entire plant affected should be carefully removed, the useless portions burned, and the tubers boiled without delay. If possible the surrounding soil should also be removed and burned, or at least heavily dressed with gas-lime. Further, when the field is next planted with potatoes the piece of ground where the disease appeared should be fallowed and dressed with gas-lime at the rate of four to five tons per acre. If the attack has occurred in a garden required for frequent potato growing, the occupier should dig out and burn, not only the affected plant, but a considerable quantity of the surrounding soil so as to ensure that every fragment of the diseased plant is destroyed. Gas-lime should then be applied to the soil. If fields worked on the four-course rotation have become generally infected, farmers should replace the potato by some other crop, so as to let eight years intervene before the next potato crop is planted. The sets should be dusted with sulphur before planting, as recommended above. (a) The ground toward the end of April, should be covered with gas-lime (two pounds to the square yard), which may be forked into the surface soil to a depth of three inches. After lying fallow until the end of June it should be dug and prepared for cabbages. (b) If the soil be deep, two pounds of gas-lime per square yard may be applied at the end of March, and a month later the soil should be inverted by deep trenching. Any crop except potatoes may be grown. Whichever of these methods may be adopted it is desirable, when potatoes are next planted in the garden, that the sets should be dusted over with sulphur, and as they lie in the drills should be freely sprinkled with sulphur before they are covered in. Before the potatoes are earthed up, the surface of the soil round the haulms should be sprinkled with sulphur. Gardens in which even a single diseased potato has been found, the course recommended in the foregoing paragraphs should be adopted; but if no other land for growing potatoes is procurable, and occupiers of gardens and allotments are obliged to grow potatoes on land on which disease has been seen, they should apply gas-lime in autumn or early winter at the rate of three pounds to the square yard. After the sets have been placed in the drills they should be freely sprinkled with sulphur. Before the plants are 'earthed up' the ground should again be sprinkled with sulphur. Some varieties of potatoes are not affected by wart disease, or are very slightly affected. The varieties known as' Snowdrop,'•' Conquest,' 'Abundance,' 'Langworthy,' 'What's Wanted,' and ' Golden Wonder,' have escaped infection, when such other sorts as ' Up-to-date,' ' Northern Star,' 'British Queen,' 'Royal Kidney,' 'King Edward VII.,' 'Epicure,' 'Express,' 'Ninety-fold,' and 'May Queen,' planted in the same soil have been severely attacked. Early potatoes often escape attack the first two or three years, i. e., until the soil gets badly infected. Early Blight. 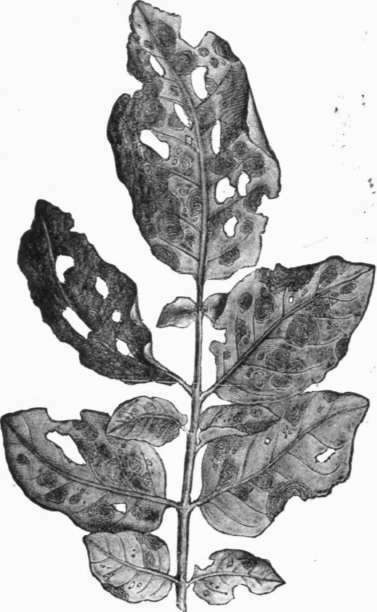 Characteristic appearance of badly blighted leaf. Potato Scab. From Farmers' Bullet 91, U. S. Department of Agricultur. Upper left-hand figure shows affected stem. 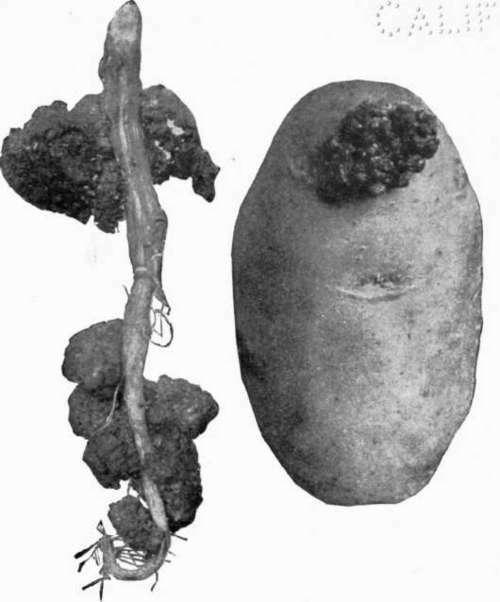 Upper right-hand figure shows tuber slightly attacked. Lower figure shows tuber badly attacked. Illustration from circular of British Board of Agriculture and Fisheries. (1) Cultivate the land deeply: shallow soils should be subsoiled, or in the case of gardens, trenched to a depth of fifteen inches. (2) Apply dung liberally. In the case of fields, fifteen to twenty tons per acre, and supplement this dressing with a mixed artificial manure. (3) Sprout the tubers before planting, and plant early. Sulphur suitable for the purposes indicated above should be procurable at from 9s. ($2.25), to l1s. ($2.75), per cwt., or Is. 3d (31 cents), to 1s. 6d. (37 cents), per stone (fourteen pounds). Sulphur has been recommended because, of many remedies tried for dressing soil during the growing season, it seems to be the best. It occasionally does good, especially in light soils, but it cannot be relied upon to protect potatoes planted in badly affected soils. Its good effect seems to be enhanced by using black sulphur and mixing it with an equal quantity of quicklime. Wart Disease (Synchytrium endobioticum), is scheduled as a notifiable disease under the Destructive Insects and Pests Acts, 1877 and 1907, and occupiers of land on which the disease occurs must at once report it to the Secretary, Board of Agriculture and Fisheries, 4 Whitehall Place, London, S.W. In reporting an outbreak, occupiers must state their names in full and their postal address, and it is desirable that specimens for identification should be sent to the Board. Neglect to report renders the owner liable to a penalty not exceeding ten pounds ($50)."